Every year, the Faculty of Music at Western University offers a concert featuring a collaboration between student performers and student composers. The opportunity not only gives composers the coveted experience of having their written works manifested by training instrumentalists, but it lets the performers of the various ensembles perform fresh, living music, written by people still breathing – and who will even acknowledge your emails when contacted. The importance of this relationship cannot be overstated, and I was very eager to attend this exposition of new works at my alma mater. I took notes during the concert, and want to share some of my thoughts. Perhaps it will help put parts of this New Music concert into perspective, or at least present some fresh ideas and be a source of creative inspiration for others. A dramatic composition for two pianos which cycles through various musical moods and textures, from passive drones to active arpeggios. The two pianos often have call-and-response conversations, with one instrument picking up the lyrical phrases of another. Listening to this piece caused me to reflect on how many works in the classical tradition try to squeeze so much variety in a short amount of time, in contrast to a large amount of modern concert music and popular music, which often maintains a similar mood throughout the work. I once was in the same composition class as Justin Ma, and so am somewhat familiar with the composer's style. Like many of Justin's previous concert works, The Wind focuses largely on melody and counterpoint, featuring pretty passages shared between the oboe and flute. 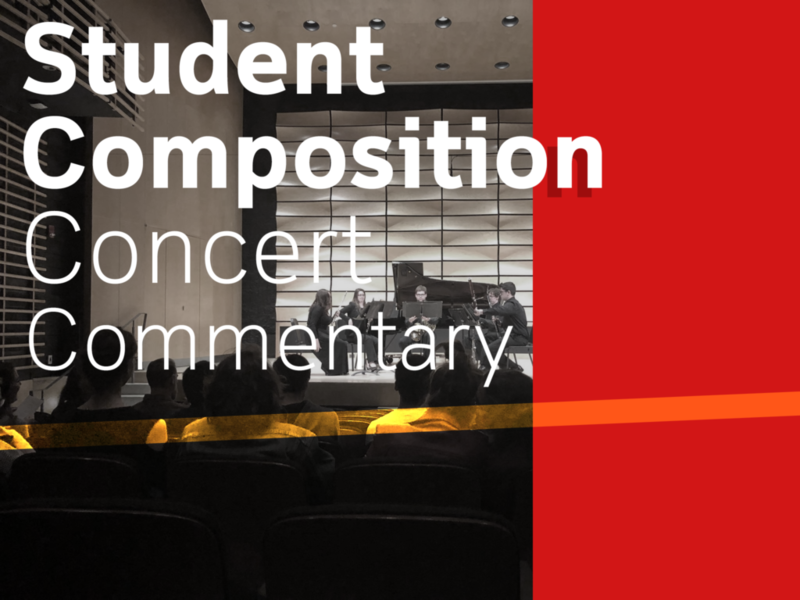 The piece is organized in a binary form, with the first, lyrical section giving way to a sardonic, almost cinematic second-half characterized by an active bass part and leaning minor-mode semitones. Not only am I familiar with Jacob's previous work, but I had also already heard this very composition. For that reason, this was the only composition on the concert program that I had heard previously. I believe, as a result of this, the piece had a very favourable impression on me. The trio's arch form takes us on a journey from an ambient initial section that intimates the dies irae motive, to a section of raspy, active strings, and finally to a central point in which the melodies in the strings have a chance to soar over an active accompaniment line. We are then led back down the same path in reverse, with additional melodic elaboration, until we arrive again at the initial, ambiguous piano gesture which settles us back down into the dark oblivion of silence. A strikingly effective use of arch form, with a magnificent sense of motivic play. Although I am not very familiar with the composer's works, I have performed a short piano piece by Xiang Li, called Cover, a somewhat minimalist piece accentuated by melodic lyricism and a large number of lofty suspended chords. This Trio is similar in many ways, but according to the program notes is intended more as a series of character studies based on people the composer has known, perhaps somewhat similar to Elgar's Enigma Variations. The initial sounds are sweet, characterized by an original, octave-leaping piano melody, attractive accompaniment, and charming contrapuntal conversation. Later movements begin to break from our formal and harmonic expectations, as the texture is disintegrated, and unaccompanied solo lines are weaved elegantly into one another. Seemingly a study in contrasts, Lupker's composition explores the differences between the timbre of the piano and strings, as well as the smooth and staccato gestures expressed in each. These individual elements of juxtapositions are given their own moments of immense elaboration as well, such as a section of the piece where the strings are given the solo opportunity to explore a smooth, layered texture, where overtone-oriented melodies pops out of each instrumental utterance, rather than being a confined to a single instrument. Listening to this composition, I came to reflect on another particular aspect of many concert works, which often feature a high degree of contrast. While many popular works would be offset by the type of segmented writing here demonstrated by Lupker, the focused listening required of this style naturally lends itself to more surprising shifts of mood and tone, and in this case Lupker manages to keep the audience attentive throughout the entirety of this very intriguing piece. The last review I wrote on this website was actually of an EP released on Noseworthy's record label, People Places Records. Noseworthy, who studied in New York amongst the high-energy composers of Julia Wolf's circle, brings to many of his compositions a spirit of integration between popular and art traditions. Caretaker of Collection certainly follows this path as well, taking complicated polyrhythms and apparently algorithmic ways of treating pitch collections, and presents the package in a very accessible, playful, and even optimistic way. The brass and electric piano sounds gave the performance a toybox quality, lending the piece's harmonic complexity and sense of experimentation a certain innocence and openness, inviting listeners who may otherwise be put off by the existential brooding found in the sound worlds found in a multitude of process-based compositions. Inspired by the composer's own experiences with Insomnia (yet another connection with the last review I wrote on my website! Give my review of the Findings EP a read! ), Sleepless evokes a cinematic atmosphere that cultivates a sturm und drang sensibility, culminating in a grand, dramatic crescendo. Gross undulates between simple chord patterns in a lullaby-like way, but prevents us from falling into dreams by means of the dark, abrasive busyness of the sharp string melodies. The piece is therefore a meditation on frustration, with a desperation for dreams being kept distanced from peace by the vast, stormy sea of desire. I've recently spent some time looking over the music of Aaron Po, with the assistance of the composer himself, who has forwarded me copies of sheet music for the purpose of study. Having developed a more intimate understanding of Po's musical imagination, I was excited to see what creative developments the composer would explore in this work. Po's ordinary style of choice is Reich-inspired minimalism, compositions which morph around a single, impersonal process. But in Four Miniatures, Po takes a step in a different direction, focusing more on melody and counterpoint, in a Wagnerian-verging-on-Shostakovitch harmonic idiom. The miniatures in this collection modulate from the languid to the intense, and like Xiang Li's composition, disassemble themselves in later movements to present a pointillist approach to the basic material. A fascinating development for Po, and a fine indication of the composer's imaginative scope. The classical guitar is generally an incredibly quiet instrument, and Tsang's composition very much reinforces the essentially intimate aspect of this ensemble. The title, with Ténèbres, meaning darkness en français, sets a tone in conjunction with the quiet, melancholy minor moods, of a nocturnal scene. Yet the romanticism of a returning, folk-like melodic whisper played across the octave spectrum, complimented by Debussy-derived chordal planing, lends this intimate piece an immensely nostalgic flavour. Max Lucas is both a friend and frequent collaborator of mine, and you can even discover some projects we have created together on this website. Speaking with the composer before the performance, I was able to secure a copy of the score, and so had the opportunity to trace the notation as I listened to the piece for the first time. Notably, Lucas labels his name in all lowercase letters on the score's cover. Whether this is an attempt to remove the composer's ego from the attribution of creation, I cannot say, but in any case the score was filled with many intriguing details and notes that would no doubt be of interest to any listener. The composition itself is, much like Ma's composition, divided into two contrasting sections, the passacaglia and the jig. The passacaglia is based around a fascinating, stumbling alternation between a 3/4 and a 3.5/4 pattern, over which string melodies soar in harmonic ambiguity. Later, after the dividing centre of the piece, a theme resembling an east-coast Canadian jig is introduced, jumping around the strings of the fiddle, and leaping around bar-lines, obscuring a sense of meter. The treatment of the jig is quite beautiful, and is representative of the best way of bringing folk traditions to life in a New Music context. Lucas highlights the characteristic elements of the style, but exaggerates and extends them, unleashing a hidden seed of sanctity hidden within. Indeed, this composition seems to contain the potential for a much larger work, which would handle its folk themes in a much more elaborated and varied manner. But in this case, Lucas's composition manages to be, in a shorter time frame, brimming with creative ideas and sophisticated elaborations. It's hardly a novel thing to say that New Music is never performed enough. Perhaps because of the inherent abstraction of music, it's rare for regular audiences to have an interest in new compositions, unless they already have some emotional connection with the material, whether through their relationship with the composer or the subject matter being explored. I remember hearing from members of the Calgary Philharmonic Orchestra that even Mahler was considered too progressive for their regular programming. Mahler! Nevertheless, like anything in life, it's important for composers to know that it's often quality that counts, not quantity. At the end of the day, the audience for new works is small, and is potentially shrinking everyday as music is increasingly evolving from an emotional/intellectual relationship with sound into a background, commercial commodity valued more by its resemblance to the familiar than its creative content. Nevertheless, there are still many people who know the value to be found in New Music, and are able to abstract the wisdom, excitement, and beauty that stirs within this magnificent means of communication, which not only provides practical organization and insight to our amorphous existence, but brings a welcome spark of creative joy into this game of life. My sincere thanks to all who participated in the performance, administration, and composition of this fantastic concert. I wish luck, accomplishment, and creativity to all involved as they pursue their curiosity and future musical careers.